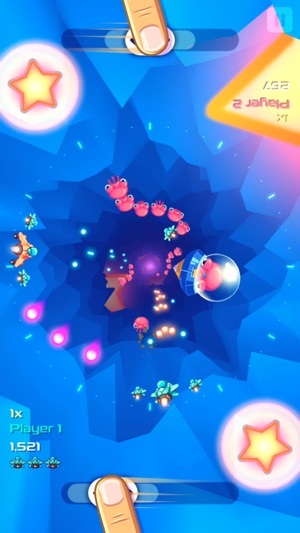 A super fun space shooter with circular rail-shooter gameplay. You can play alone in single-player mode or play with your friends on the same device in co-op mode. Aliens have conquered our planet. Only the bravest pilot can fly deep into enemy territory to attack. 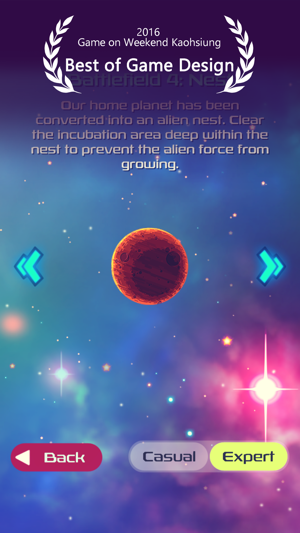 Fight side-by-side with your friends, piloting your space fighter to eliminate alien invaders! ◆ A unique “tunnel shooter” experience! 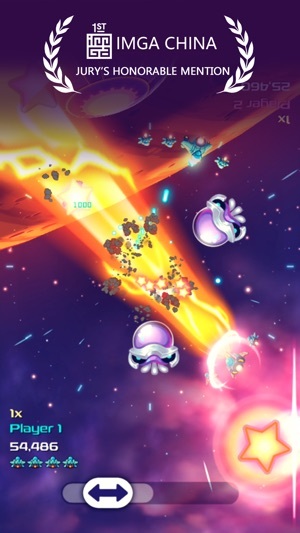 Space Cycler is a retro space shooter with nostalgic circular rail-shooter gameplay. 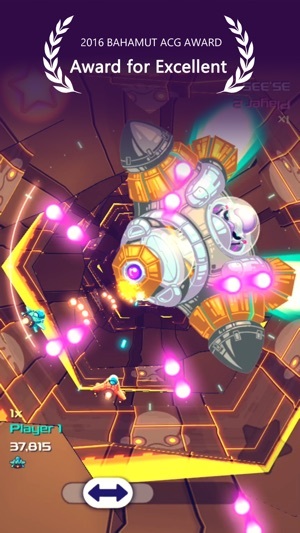 You control a space fighter flying at high speeds through a tunnel while facing incoming enemies. ◆ Co-op for double the fun! Play with your friends on the same device in co-op mode. 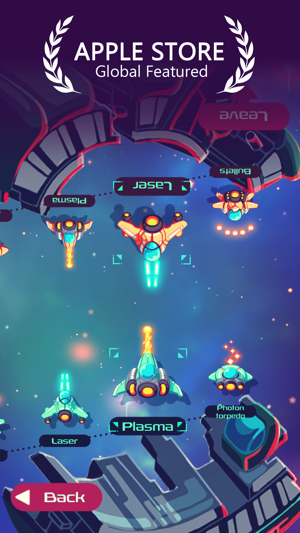 The players each control a fighter and must coordinate to defeat the enemy. In co-op mode you can save a teammate who is on the verge of death and bring him or her back to the battlefield. However, your fighters might collide, so be careful! The game is designed to be played with one hand. Just move the horizontal slide bar left and right, sit back, and enjoy. ◆ 3 space fighters and 3 ultimate attacks! The game includes 3 types of fighters, and each one comes with different weapons and ultimate attacks! 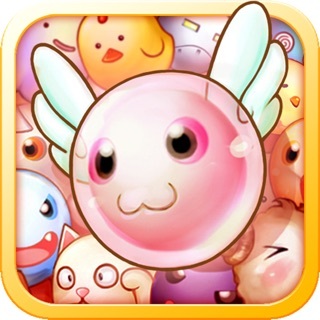 ◆ 5 main levels and 10 boss fights! The game has 5 main levels that include enemies and bosses with various attacks, making this more than just another shoot 'em up game. ◆ Global and friend leaderboard! 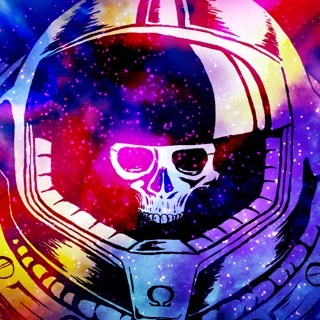 Space Cycler supports the iOS Game Center leaderboard and achievement system. Log in to your account and compete with your friends and players around the world to see who is better. Here come the brand new missions and spaceships! A destructive monster, called “Nian”, living deep inside the universe will arise during the Lunar New Year. Go defeat it and you will get a new spaceship. Don't ever miss it! Very fun to play and love the tunnel concept. Also appreciate the fact that it’s a premium game with no IAP. However, the game is incredibly hard after the first planet and just because boring and impossible. Please add difficulty levels in the settings. Not everyone wants to try 100 times at beating a level, especially if we are gaming on the go. Thank you for your feedback. We value every feedback. We noticed that the game could be too hard and should be more enjoyable for everyone, so we added a new Casual difficulty. We hope you like it. The game reminds me of one of my arcade favorites, Gyruss. However, the controls only provide frustration. I want to really like this game in spite of the controls, but right now it deserves about 3.5 stars. I find I just can’t enjoy it in its current form. If different controls are added, I could easily see my rating go to 5 stars. The game is well made; the art is colorful and nice to look at. Unfortunately, there's only 5 levels in the game. Quality over quantity definitely applies to this app. However, it's a blast to play. I hope they add more in the future.